Phillies Trade Darin Ruf: What Went Wrong? So, this is how it ends for Darin Ruf and The Phillies – a trade to the Los Angeles Dodgers along with Darnell Sweeney for Howie Kendrick. How exactly the Dodgers will use Ruf remains to be seen. Who knows? Doesn’t really matter though for Phillies fans, as Darin Ruf is no longer their concern. Looking back it’s hard to believe that at one point there were very high hopes for Ruf as a Phillie. He had set a Reading Phillies record for home runs in a season with 38 in 2012, breaking the mark set previously by Ryan Howard. It would be wrong to not mention at this point that Ruf’s record was broken by Dylan Cozens this past season when Cozens hit 40 last season. What a lot of people don’t know is that Ruf played in both the majors with the Phillies and in Venezuela winter ball that year. Down there he hit another 15 home runs, essentially giving him a 53 home run season. Hey, let’s hope things work out better for Cozens with the Phils than they did for Ruf though, right? Probably couldn’t be worse. 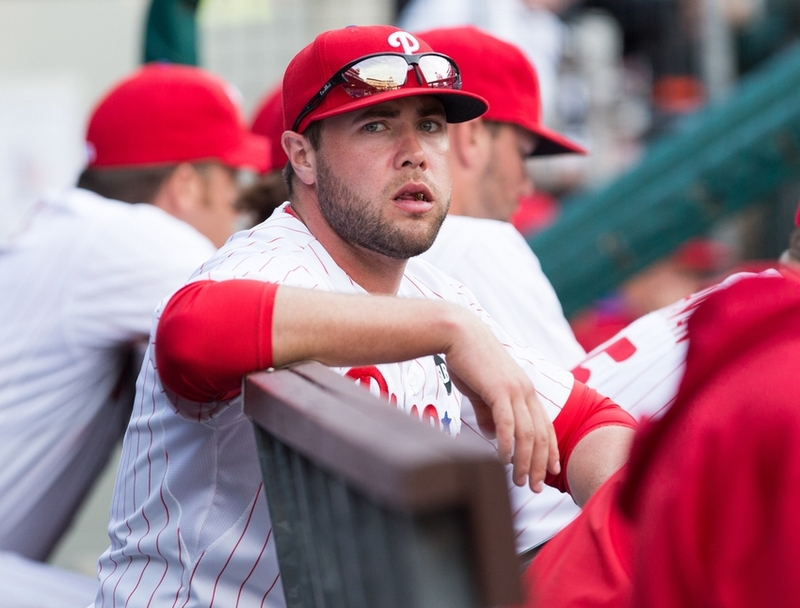 So what went wrong for Darin Ruf as a Phillie? 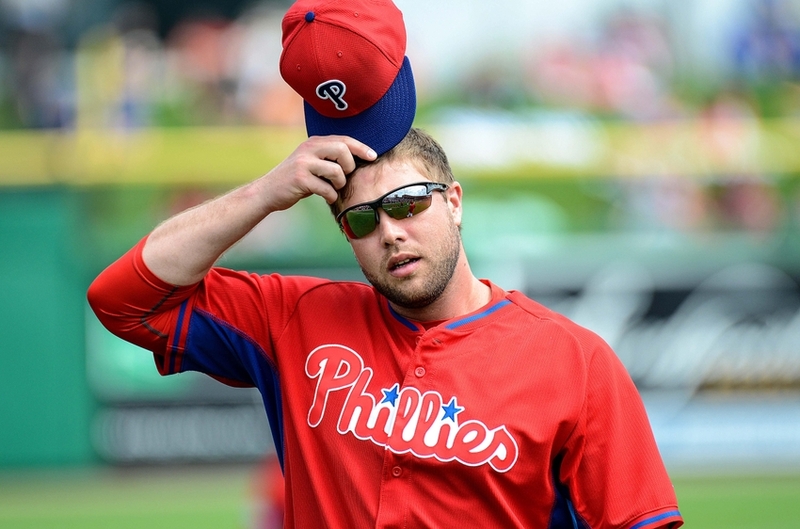 11/12 – Phillies Trade Darin Ruf: What Went Wrong? 11/11 – Phillies: Japanese Superstar SP/OF Shohei Otani an Option? He got very unlucky on a few counts. Ryan Howard pretty much had Ruf’s position locked up. That was the first bit of bad luck for Ruf. It’s unfortunate but Ruf really wasn’t built to play anywhere else on the field. He could have probably been a catcher, but that’s not a position you just pick up once you reach the majors. No, Ruf was a first baseman in an organization that had just signed it’s star first baseman to a gigantic five-year extension…and that wouldn’t even go into effect until two years after he signed it. First base wouldn’t be available until at-least 2016. The other bit of bad luck for Ruf was the “era” of Phillies baseball that he would be ushered into. See, believe it or not, at one point against almost all logic and even hard-core information that was available to the contrary, the Philadelphia Phillies front office didn’t value something that Ruf was very good at: taking walks. Ruf could work out a walk at one point early in his career, but it didn’t last. It’s not surprising it didn’t last because all he ever got for it was a demotion to the minors. From 2012 (his major league debut) to 2014 Ruf accumulated 447 plate appearances in 137 games. That’s equivalent to almost a full season, and is 55 plate appearances shy of “qualifying” for a batting title. In that span Ruf only hit .251 but he managed to get on base at a very respectable .339 clip. For reference, a .339 OBP would be the third best on the Phillies over the past three seasons. The Phillies just weren’t concerned with developing players that walked back when the previous administration was in charge. He was also hitting the ball for power in that span, managing a .466 slugging percentage. Again, for reference no one on this year’s Phils with at least 450 plate appearances had a slugging percentage that high. At the end of the 2014 season Ruf had played in 137 major league games over a three-year span and had an OPS of .805. It was at this point that the Phillies should have traded him. He was 27 and on the right team in the right situation he could have had a nice major league career, say in Oakland or Tampa Bay as an every day first basemen. Instead, the Phillies kept him and attempted to convert him to an outfielder. Over the past two years Ruf has been an awful hitter and even worse defender. Needless to say, playing the outfield for a player like Ruf – slow, not a great arm, no experience ever in the outfield – was not a successful experiment. He was never given the opportunity to get into a rhythm in 2016, and could not hold onto his spot on the 25-man roster as he was repeatedly optioned to AAA. Ruf played in 149 games over the next two years and produced a slash line of .228/.285/.396. It should be noted that during that time he was often in the minors playing everyday and there he managed whopping .979 OPS in over 400 plate appearances. Clearly, playing regularly was crucial to Ruf’s success. Quite frankly, it’s shocking the Phils were able to get anything for him. For the Dodgers, they’ll most likely use Ruf in a bench/platoon situation. For his career Ruf has managed a remarkable .921 OPS against left-handed pitching. He has 17 home runs in 271 career at bats against southpaws, which is an average of a home run per 15.74 at bats. He might even be given a chance to do something in LA he wasn’t given in Philadelphia: platoon at first base. Sure, it won’t be often with Adrian Gonzalez playing there, but Gonzalez has become a bit prone to left-handed pitching as he’s gotten older, only managing a .602 OPS in that situation last year. In 2015 when he last got significant at bats against major league lefties, Ruf had an astounding 1.107 OPS in 114 plate appearances. By all accounts, Darin Ruf is a decent guy, a good teammate. He never complained about his demotions here or some of the bad breaks he had. He just accepted his assignment and went to play where he was sent. Hopefully it works out for him in LA and he has finally found a spot where he will stick.